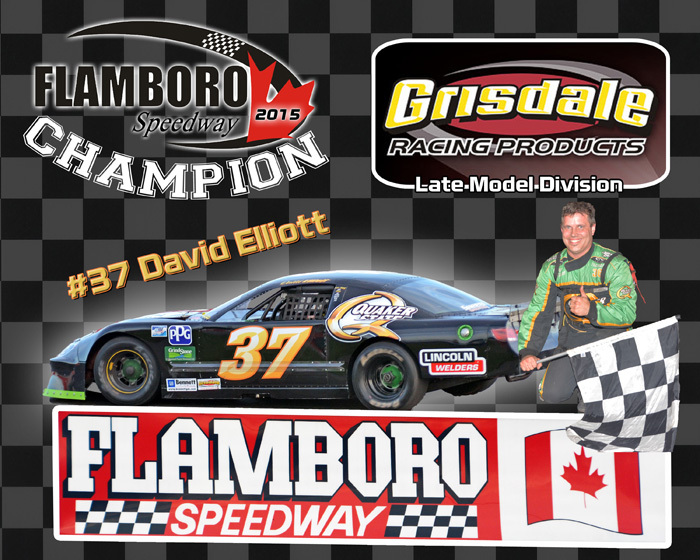 Saturday night David and his team celebrated their 2015 Flamboro Speedway Pro Late Model Championship. Left to right are Jim, David, Eddie and Pete. This is a great picture showing both the Annual trophy and the keeper the team gets for being crowned 2015 Pro Late Model Champion. Very proud of David, his crew and sponsors. 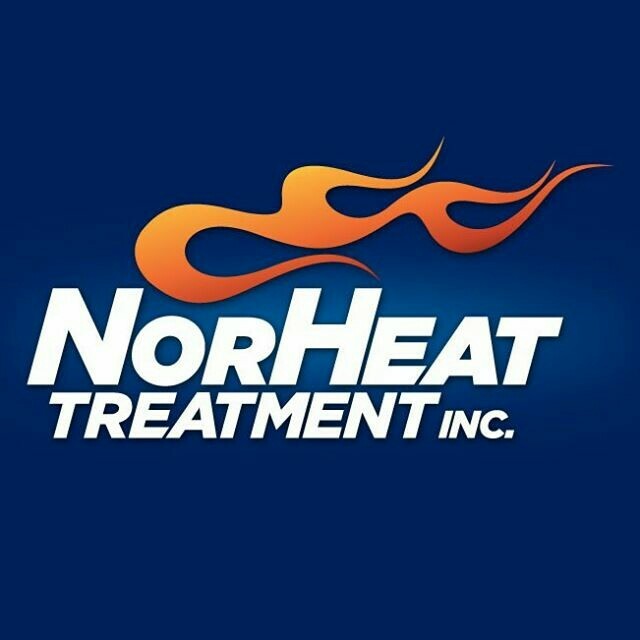 Our team is looking forward to being part of the 2016 Pro Late Model roster at Flamboro Speedway…..can’t wait. 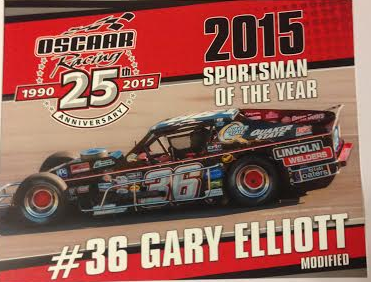 Saturday January 30th Flamboro Speedway held it’s annual banquet at the Legion in Waterdown. It was a night to celebrate and remember for David and his team. They won the title in a very tough a competitive field. This was David’s 8th title with 4 CVM and now 4 Late Model Championships. He was the first driver in CVM history to win three club titles in a row, 2000, 2001 and 2002. 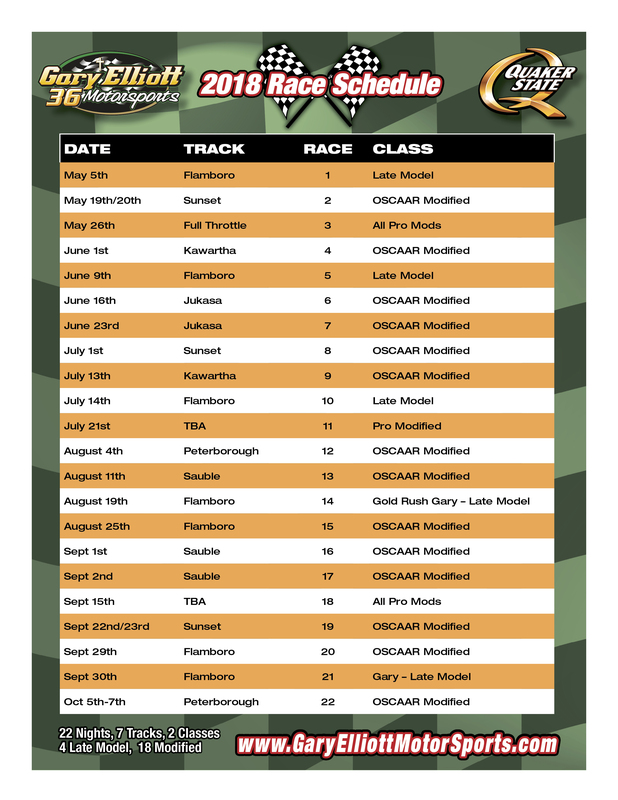 This coming season we will race our Late Model full time at Flamboro as well as five OSCAAR Modified races. 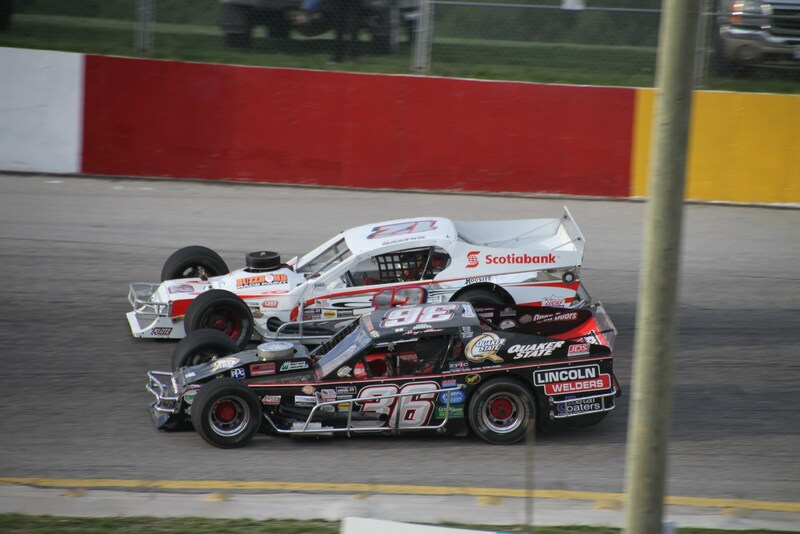 I am looking forward to racing against all the Late Model stars at Flamboro and for the first time since 2011 with David in a track series. 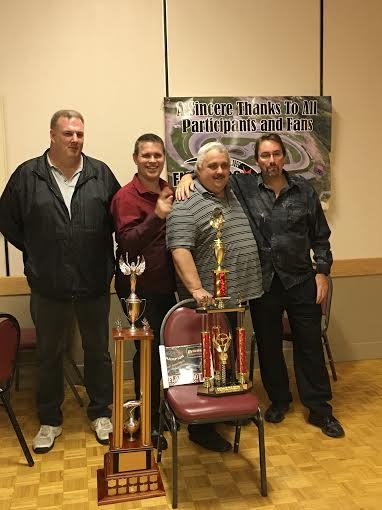 Note:…..Missing from the banquet was the Flamboro Speedway Late Model Champions Annual trophy, the main award showing all the previous winners. Track Promoter John Casale was very upset the Annual trophy was not returned to him or Frank for the banquet by last years winner. Many attempts were made to have the trophy returned but calls and requests were ignored. The missing trophy didn’t take away the joy of being the Champion and celebrating that with his family, crew and friends. January 23rd Lloyd and I attended the Full Throttle Motor Speedway banquet, a fun night with delicious food and seeing some great friends. It was the 3rd banquet this year for me. Special thanks to Gord Bennett and his staff for choosing us for the “Best Appearing Car” award in the Outlaw Late Model class. This was our 12th time winning this award. 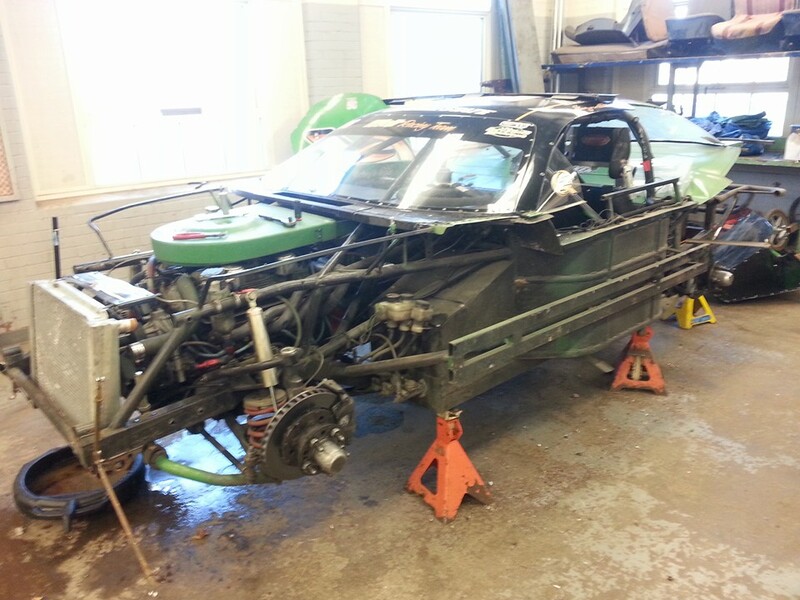 It’s time to start rebuilding our cars, a process that has already begun. 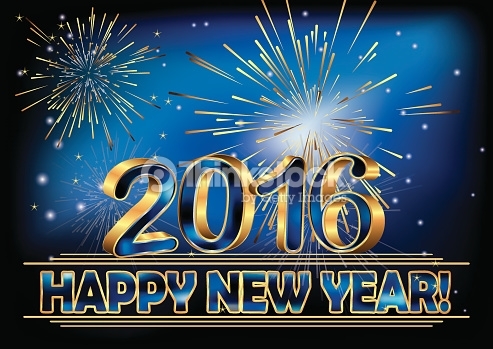 I will be finalizing our 2016 race schedule very soon with at least one big surrpise…..stay tuned. I spent a few days at Westdale Secondary School in mid December. During that time, I was asked if I would like to leave the car there and have the students start to strip the car down….I said of course! Once Christmas break was over the students got busy and here is some of their progress. They were ready to pull the engine and transmission out today. I will update more pictures as they come through. The 2016 season has officially begun. Okay, so the past few months have been crazy for me. The rush to get my stuff from Owen Sound, storage and into our new place, then sorting through tons of boxes and getting my living place organized was very successful but very time consuming…..and then Christmas, a time I love very much. Now it’s time to activate what’s been in the back of my mind, on hold, for months. The first thing I need to do is finish Diary of A Season 2105. It’s great to run 5 features in one night, but it’s another thing to write about it and I didn’t get the time to finish the stories. I will this week, because I am caught up. 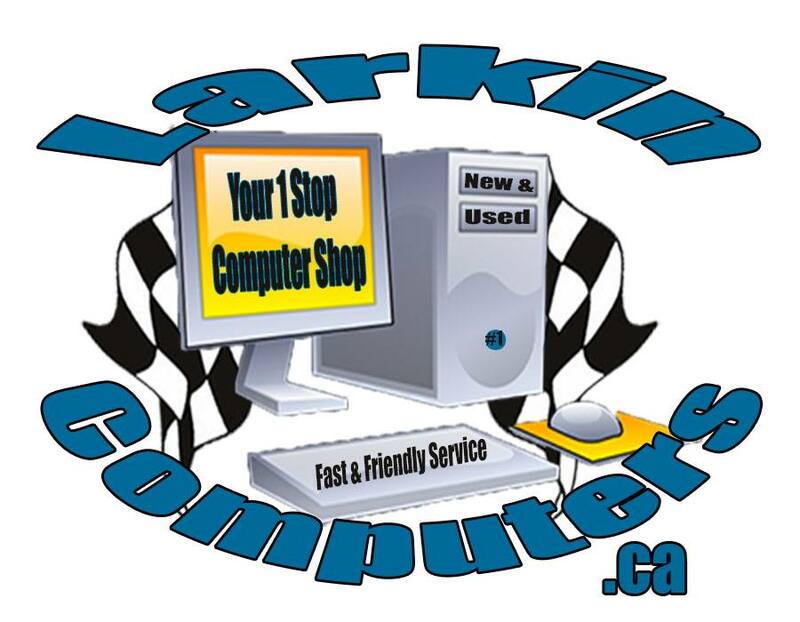 I will have my race budget done by today, my schedule soon, and confirming sponsors for 2016. 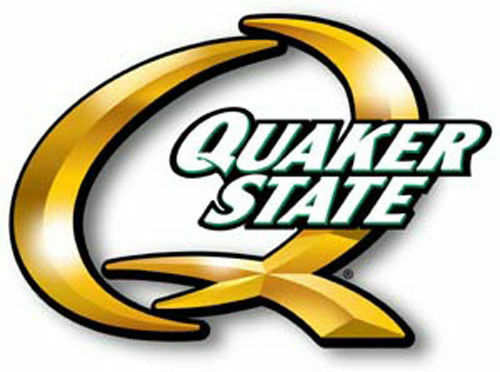 I am sure that Quaker State will be back for 2016, I should have confrimation soon. Lincoln Welders, PPG, Timber Green, Grind Stone have committed to being with me in 2016. I hope to have the rest of my sponsors confirmed within a week or so. Thanks for you patience, and your awesome support. I plan to be keeping this site updated regularily now that I am settled.